Of all the countries of the world, I always thought the Kingdom of Norway would be a great place to live. As long as you can deal with the long winters, pretty much all else is taken care of. With the highest per capital oil production of any country outside the Middle East, your cost for education is zero. Gasoline prices are pretty high — to keep consumption down. Why go anywhere by car when you could walk, bike or sled? In the northern parts, particularly Tromsø (“the capital of the Arctic” — tourist site offers only summer pics), the Northern Lights provide enough entertainment to last a lifetime. No need for a telescope here — low light pollution and the most spectacular visuals. 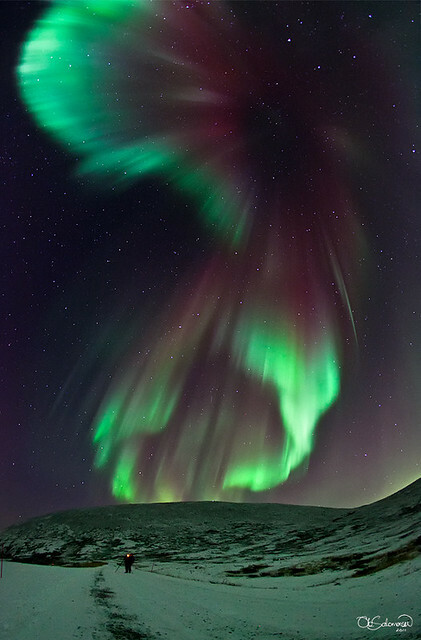 Today’s APOD by Ole Christian Salomonsen is just that: spectacular! Explanation: It was one of the most memorable auroras of the season. There was green light, red light, and sometimes a mixture of the two. There were multiple rays, distinct curtains, and even an auroral corona. It took up so much of the sky. In the background were stars too numerous to count, in the foreground a friend trying to image the same sight. The scene was captured with a fisheye lens around and above Tromsø, Norway, last month. With the Sun becoming more active, next year might bring even more spectacular aurora. One of these days, a vacation in Norway awaits.